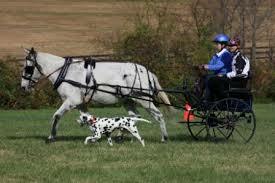 Road trials demonstrate that a Dalmatian can perform the task for which this dog was originally bred—to accompany horses and carriages. However, because of the difficult requirements, road trials competitions are not readily available so you may not have heard about them. They require six miles of trails, ideally suited for either a horseback rider or a horse and cart. Competitors must have a horse available. Some events supply rental horses. The Dalmatian Club of America hosts an annual event, and there are a few other road trials in the U.S. and perhaps more in Great Britain. “Having the dogs along on a ride doing their real job is like riding in a ‘66 Mustang convertible with the top down. You love what you are doing and you know everyone wants to be you. Having a Dalmatian as a trail companion is both comforting and rewarding. On the one hand, it’s so nice to be able to share the forest with my best friend and see the enjoyment he gets from the sights, sounds and smells. On the other hand, it is a breathtaking sight to see the dog fall into his natural gait, matching strides with the horse and sharing a relationship with an animal that’s ten times bigger, ” wrote Chris Strop in the Canine Chronicle. A good road trial prospect must have sound structure in order to run up to twelve miles following a horse. He must come reliably when called, know how to heel off leash , do a sit or down stay, and he cannot be afraid of horses. Dogs must “heel” to the horse and rider (or to the cart). After the dog is working well in an arena, the handler can start working on the trail. It takes a lot of conditioning, as well as training and practice in avoiding distractions, before a dog is ready for a road trial. In competition, Dals can earn a Road Dog or Road Dog Excellent title, a well as Road Dog Champion and Road Dog Excellent Champion. 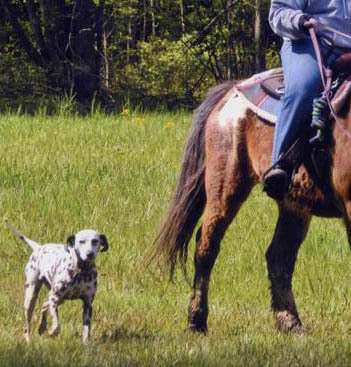 If you don’t want to compete, you can still have fun taking your Dalmatian out when you ride or drive your horse on the trail. A well-trained carriage dog is a joy to behold. This entry was posted in Breeds of Dogs, Dalmatian. Bookmark the permalink. “Having the dogs along on a ride doing their real job is like riding in a ‘66 Mustang convertible with the top down. You love what you are doing and you know everyone wants to be you,” was actually said by Peggy Ann Strupp. Lovely article, Thank You!